I try to uncover the reasons why Polish cheesecakes are liked so much. I always thought it is hard compete with food people know and like, but it looks like it is the other way around. I usually experiment on my coworkers. They seem to like it, well they even demand for more. When I asked them which cake was their favourite so far I heard – cheesecake. I’m guessing that maybe it is just a cheese is different and Polish cheesecakes have slightly more texture and heaviness, but still are creamy. But these are just pure guesses, all I know it’s a third cheesecake that everybody liked, even though it didn’t have a cookie base. In a big bowl mix slowly curd cheese adding gradually sugar. Add eggs one at the time. Add to cheesecake mixture the rest of ingredients: lemon juice, corn starch or potato starch, plain flour, and vanilla extract and mix it briefly until combined. Don’t over mix it. Grease a baking tin or line it with baking paper. Place the cheesecake mixture in a form and smooth down. Place the strawberries at the top. If you want to achieve creamier texture and nice white colour, put an oven-proof dish filled with boiling water at the bottom of the oven. Bake at 180ºC/160ºC fan for about 45-60 minutes. Cool down with a slightly ajar oven and place in a fridge for a night. Notes The recipe is very simple and you can use any other fruits like blueberries or raspberries. Posted in Cakes, Summer and tagged cheesecakes, Curd cheese, eggs, strawberries. Bookmark the permalink. 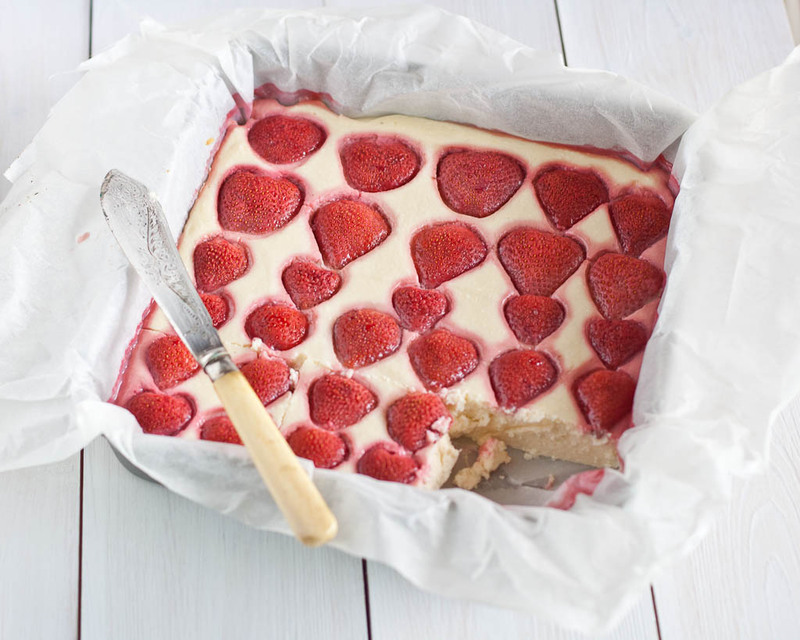 Nie ma to, jak dobry sernik 🙂 Dla mnie wlasciwie w kazdej postaci – i tej tradycyjnej, i jako ‘cheescake’. Teraz niestety moge tylko wirtualnie sie poczestowac (bo sernik bez jajek i na kozim serze to nie do konca o samo ;)). Ech Beo, szkoda, szkoda, że nie możesz prawdziwego sernika zjeść. Może jakimś cudem w końcu przejdzie. Ja póki co nie jadłam sernika na serze kozim i bez jajek, ale z chęcią kiedyś spróbuję.